Panel track blinds, also known as track blinds and sliding door curtains are a fantastic innovation to the world of blinds. Panel blinds are perfect for patio doors, large windows or as a room divider. If you’re simply looking for a stylish way to cover your windows, then look no further than our panel track blinds. At Blinds Online, we offer a great range of this style. Browse now to discover the likes of our fabric panel track blinds, basket weave panel track blinds, and sun shade panel track blinds. Any of these will be sure to add a stylish, yet contemporary flair to any window or door in your space. Many people have seen panel track blinds before, but unless you're in the design industry, it's very rare for people to appreciate how clever their design is. Panel track blinds consist of fabric panels that are attached to individual carriers that travel along their own "track." 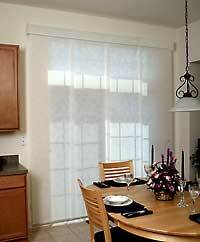 Because panel track blinds are typically made of fabric panels, there is a wide range of available fabrics available. Panel track blinds are a great choice when you want to limit the amount of light that enters your large windows or glass doors. Shop our full inventory of panel track blinds for all of our stylish color choices! We’re a premier supplier of panel track blinds, so you know that you’ll be getting the best prices, alongside the best products!